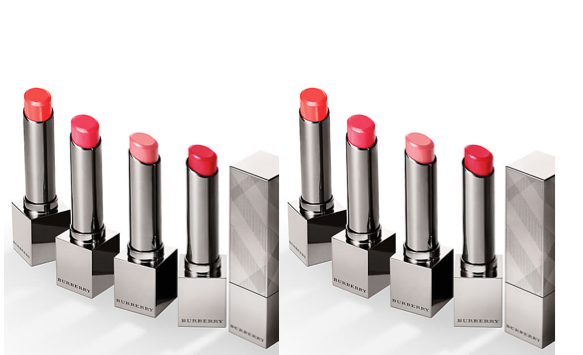 Burberry now has a brilliant ‘wardrobe’ of lipstick styles (never mind shades): lip options which are a pleasure to use – partly because of the quality packaging (it feels glamorous and luxurious), but mostly because of the textures. This is just fantastic: a really comfortable-to-wear sheer lipstick which is nevertheless highly pigmented, so you can get quite intense, transparent colour if you go for something like Midnight Plum No.297, or Cherry Red No.301. In all, there’s a very substantial portfolio of 28 shades – and being sheer, they’re more ‘foolproof’ than creamy or satiny versions of the same colour. More like a super-hydrating balm in texture than a lipstick, they have a lightweight gel texture which glides on easily and almost seems to ‘melt’ into lips – which are conditioned with Burberry’s signature soothing lipcare fusion of tea, rosehip and lavender. In all, the lipstick’s said to ‘lock in’ moisture for up to six hours. A ‘comfy-slippers’ lipstick – but with the glamour of marabou-trimmed mules, rather than the Celtic Sheepskin version.